Eva Panagiotakopulu went to the ancient city of Amarna, Egypt, to study how people lived 3,500 years ago through fossilized insect remains. Unlike the nice clean city portrayed in many reconstructions, the city, she discovered, was infested with bedbugs, fleas and flies. And what she found in the insects was also a surprise: plague. On further inspection, Panagiotakopulu began to think that perhaps the plague did not originate in Central Asia, as has long been believed: Perhaps it began in Egypt. 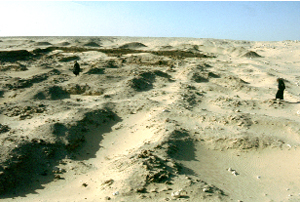 Paleoentomologist Eva Panagiotakopulu found plague in fossilized flea remains in ancient ruins in Amarna, Egypt. She now believes the plague may have begun in Egypt rather than Central Asia. Photo courtesy of Eva Panagiotakopulu. Epidemic plagues have been documented all over the world throughout the ages  the 13th to 12th century B.C. plague of the Philistines, the 5th century B.C. Athenian plague in Greece, the A.D. 6th century Justinian epidemic in the Eastern Mediterranean, and the most infamous, the Black Death that killed more than one-fourth of Europes population in the Middle Ages. And plague is still present, with 1,000 to 3,000 cases reported worldwide each year, according to the World Health Organization, and a reported 10 to 15 individual cases each year in the rural United States, according to the Centers for Disease Control and Prevention. In almost all cases, plague epidemics strike areas with poor and cramped living conditions, much like the Workmens Village section of Amarna where Panagiotakopulu, a paleoentomologist at Sheffield University in England, carried out her research. Amarna, the site of excavations by Barry Kemp (a renowned Egyptologist from the University of Cambridge), is a good place to study ancient life in Egypt, Panagiotakopulu says, because the site is well-preserved in the dry desert sands. Archaeologists have flocked to the site for more than 100 years to learn why the city was capital for only 20 years (around 1350 to 1330 B.C.) and then abandoned. However, Panagiotakopulu is the first to look at fossilized insect remains in the ancient city. The Workmens Village was the section near the ancient capital reserved for the artisans who toiled on the nearby stone tombs for the pharaohs Akhenaten and Tutankhamun. There, Panagiotakopulu found a very high frequency of fossilized human fleas, bedbugs and other insects and parasites that present a picture of squalid living conditions in and around the workers houses, she says. Because pandemic plague throughout history often first showed itself by a large number of black rat deaths, scientists have long thought that plague originated in India and Central Asia, where black rats were endemic. They thought the plague then spread throughout the Mediterranean and Europe by fleas on black rats that entered the Mediterranean region via shipboard trading. But the identification of fossilized plague bacteria in the fossilized fleas in Egypt led Panagiotakopulu to hypothesize that plague instead originated in Africa, in fleas that fed on the endemic Nile rat. The plague only grew to epidemic proportions when the Asian black rats  new hosts  were introduced to Egypt, Panagiotakopulu wrote in the February Journal of Biogeography. Because fleas, Nile rats and plague coevolved simultaneously in Africa, Panagiotakopulu says, Nile rats did not die of the disease but passed it on. When black rats, which had no immunity to plague, were bitten by plague-ridden fleas, they easily contracted and spread the disease around the Mediterranean on the ships of traders who also spread the disease. Furthermore, Panagiotakopulu says, the annual flood of the Nile helped bring into contact the primary host (the Nile rat) and its parasite with a new host (the black rat), in early urban areas. But, she cautions, further detailed paleoecologic and pathologic research will be needed to substantiate her findings. Paul Buckland, an environmental archaeologist and paleoentomologist at Bournemouth University in England, says that fossil insects are important to the study of daily human lives from thousands of years ago, including what diseases humans may have faced and their quality of life. A more regional picture of climate and environment is also available from the insect record, including evidence for crops, weeds and pest infestation of stored products, including mummies, he says. Panagiotakopulus research and findings are tremendously original, he says, and provide new dimensions to the study of the past.